In addition to our love of classical music (as discussed in our article about Salzburg), Justin and I also, from time to time, like to enjoy an intense night…at the ballet. 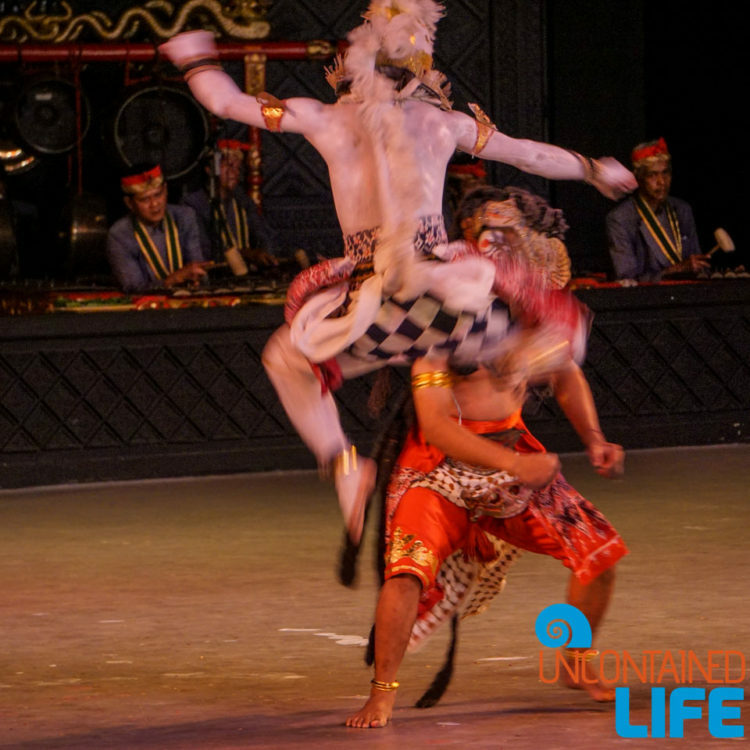 And while it wasn’t exactly the same kind of experience as back in the US, we had a fantastic time going to see the Ramayana Ballet in Yogyakarta: The life and death situations. Dramatic lighting and smoke. The intricate maneuvers. And that was just the scooter ride getting to the ballet. 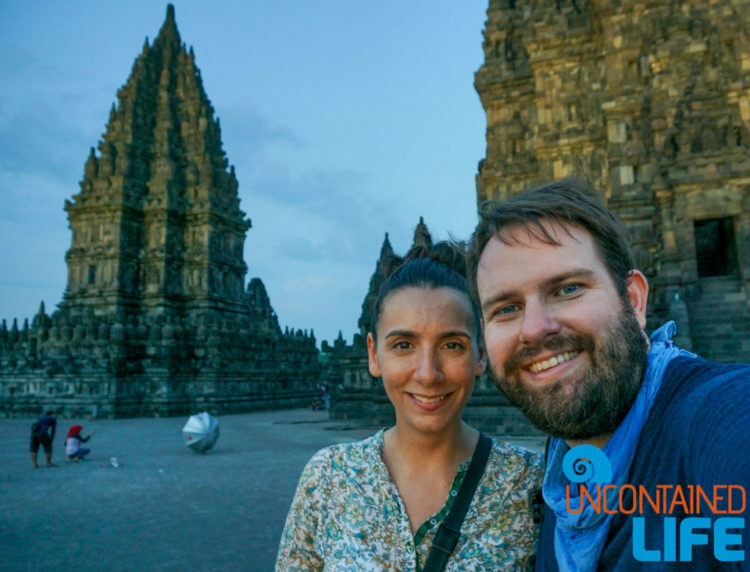 The Prambanan temple is a UNESCO World Heritage Site which dates back to the 10th century. The three main temples in the complex are dedicated to the Hindu gods, Shiva, Vishnu, and Brahma, and are decorated with reliefs illustrating the epic of the Ramayana (yes! the same story as the ballet). We have more photos of the temples by daylight…which we’ll show you at another time. Show of hands of people (or raccoons) who do not like shiny things. Ok, now that all the liars have revealed themselves, let’s move on. 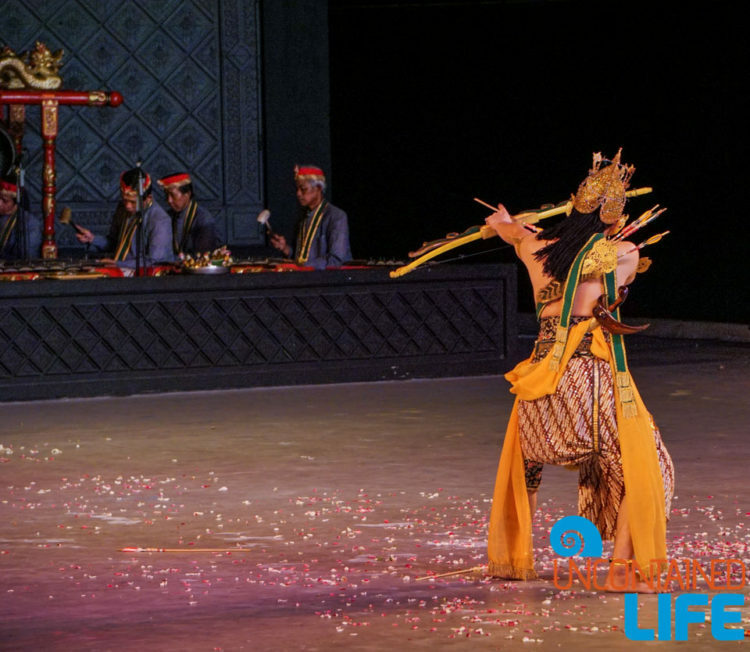 But seriously, folks, half the fun of going to see the Ramayana Ballet lies in the colorful costumes, dramatic masks, and traditional garb. It’s like a damned Skittles commercial. For those who remain unimpressed by glittery and/or hairy costumes however, there is also the moment in the ballet when they burn half the set down. And yes, it’s even cooler (hotter?) in person than it looks in the photos. Justin and I first heard about the Ramayana ballet right around the same time that we mastered the art of squeezing a scooter in the two foot space between a bus and a curb. 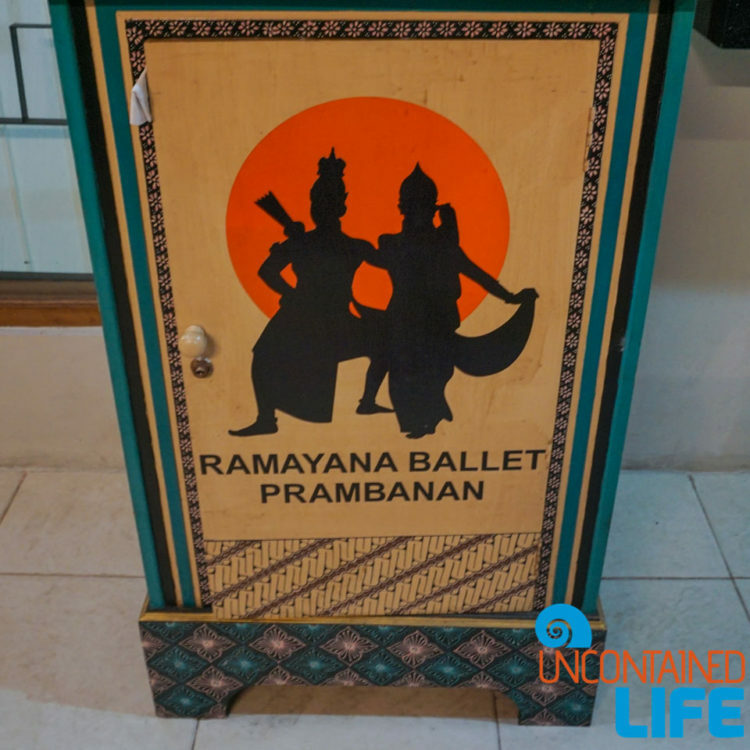 We had already been planning to visit Prambanan, and the ballet seemed like a cool add-on to that trip…but we wanted a bit more info. 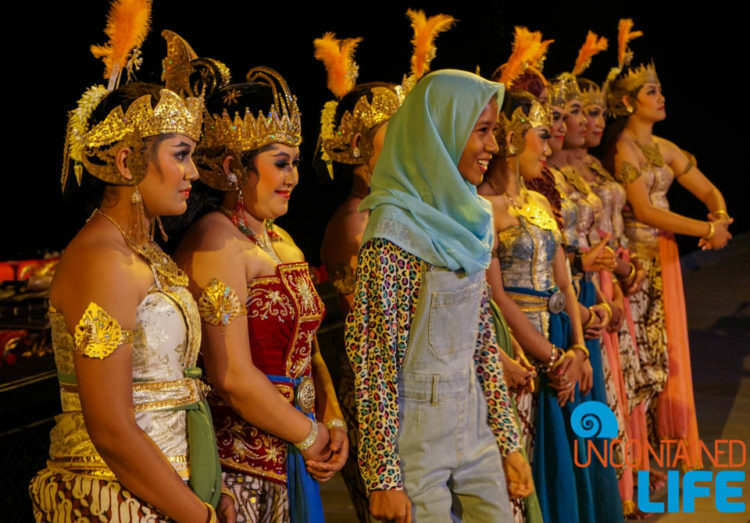 about why Javanese dance was such a big deal. So, we decided to ask some locals who gave us the scoop: basically, Javanese dance was a huge part of court life back when Java was an independent nation. But then, following the end of Dutch colonial rule in the 1940s, the new unified Indonesian government decided Javanese dance was too divisive: they saw it as a celebration of Java, not of Indonesian culture as a whole. So, they outlawed the dance. But, as history shows us again and again, (and as Footloose will attest) art doesn’t bow as gracefully to politics as some might desire; people continued to practice and teach Javanese dance in secret and, at some point, the government realized the law was dumb, and the dance began to be performed publicly again. 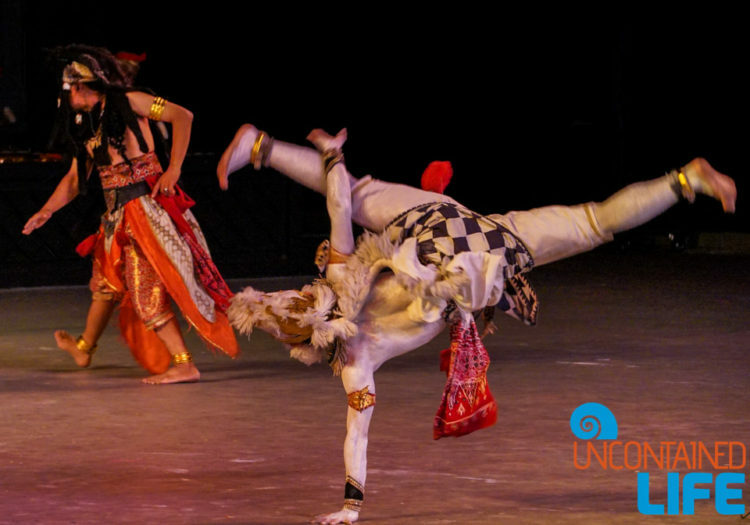 Since the ballet performances at Prambanan began, they’ve attracted the most talented professional dancers, and students–and we understood why when we saw the dance moves themselves: so precise, so controlled. (Apparently, each pattern and movement has symbolic significance.) It’s no wonder people rush the stage after the end of the performance for selfies with the dancers! And music accompanying the ballet is, of course, another unique element. 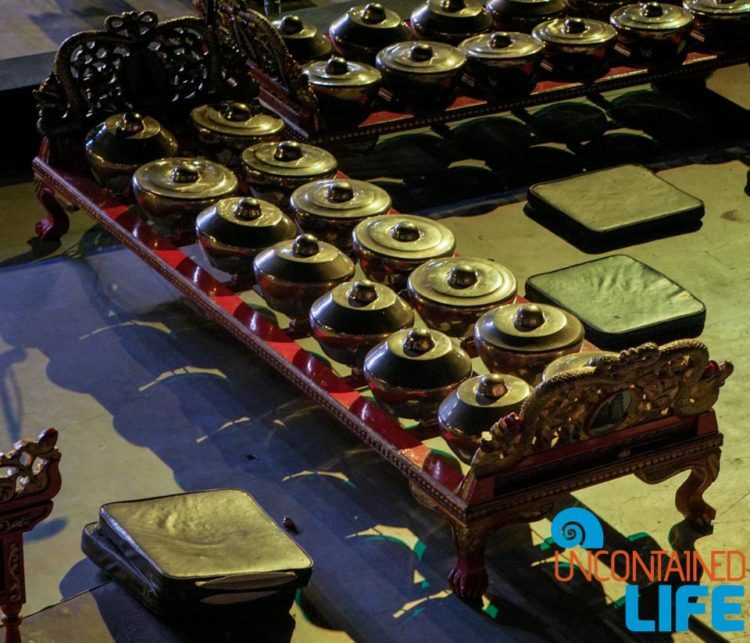 A full gamelan orchestra typically consists of some 60 to 80 musical instruments, including a large percussion section–complete with bronze kettle drums, xylophones, and gongs–as well as spike fiddles and bamboo flutes. 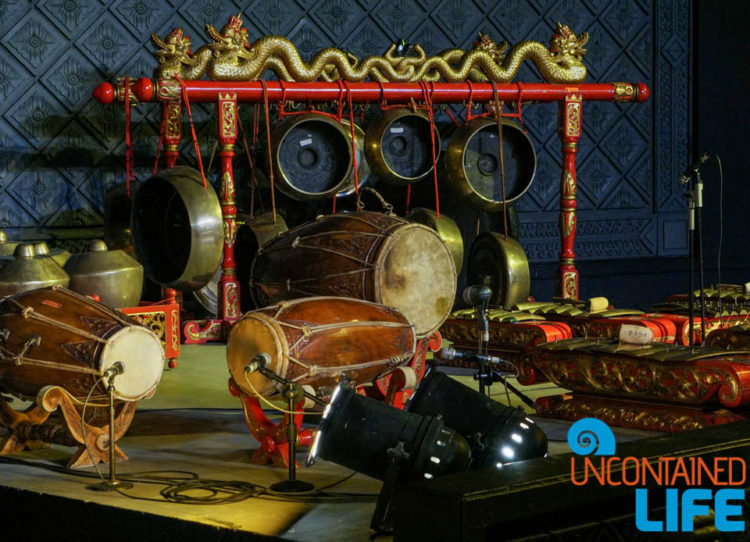 Like many other eastern cultures, Javanese Gamelan music is based on a pentatonic scale and your (western) ears will, most likely, not be used to the sound. 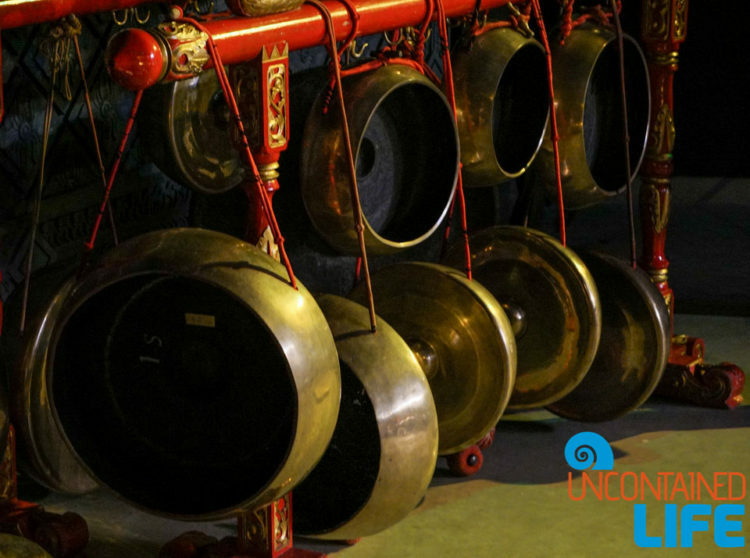 But, give it a few minutes and you will soon come to appreciate the music, the rhythms, and the sounds of the Gamelan orchestra. Intermission. You following so far? Even if you’re confused, at least the animals are cute. So many things could be said about that last part of the story in particular. So. Many. Things. 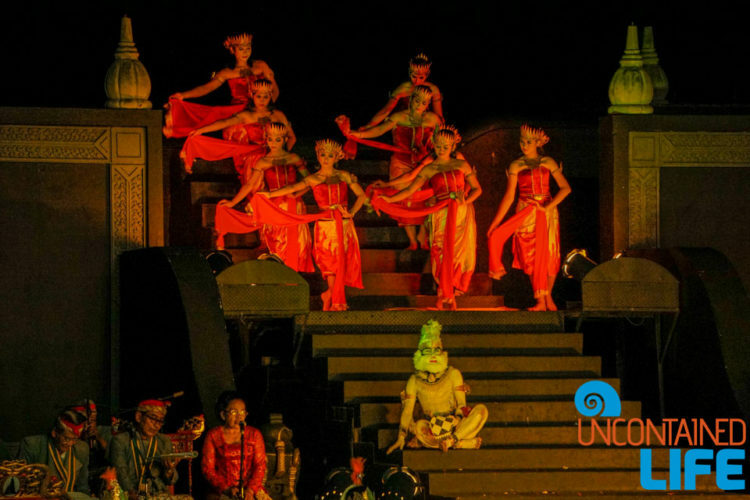 The Indonesian dance drama Sendratari Ramayana Prambanan was performed in front of 400 people at the UNESCO headquarters in Paris on Tuesday night. 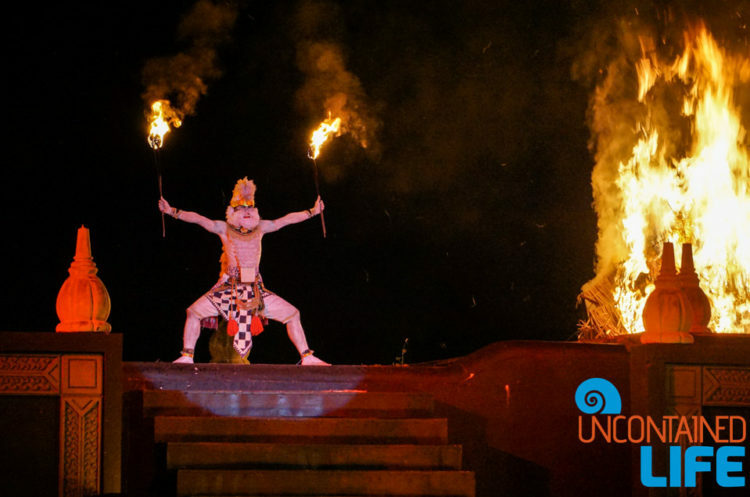 The performance was part of celebrations to mark the 25th anniversary since Borobudur and Prambanan temples were included on the organization’s world heritage list, as well as the 20th anniversary since the Sangiran Early Man Site joined the same list. 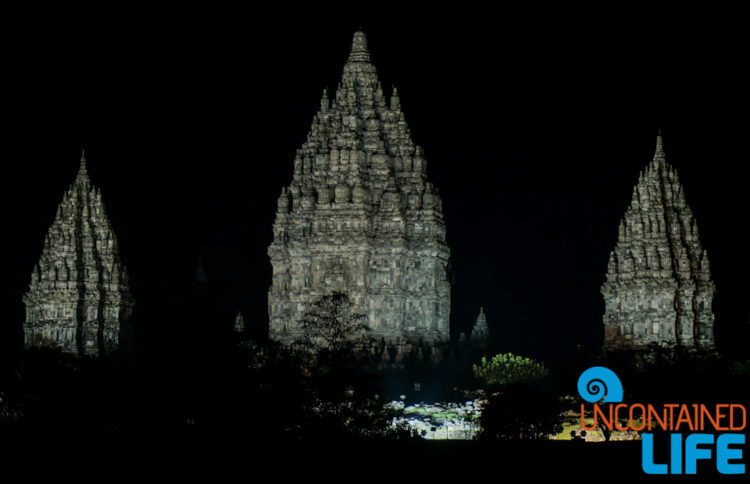 “Indonesia has received a lot of benefits from UNESCO in preserving the two cultural heritage sites during the 25 years since its inscription,” stated Hotmangaradja Pandjaitan, ambassador and permanent delegate of Indonesia to UNESCO, as reported by Antara news agency. He said the decision to hold a celebratory performance at the UNESCO headquarters aimed to show gratitude toward the organization. 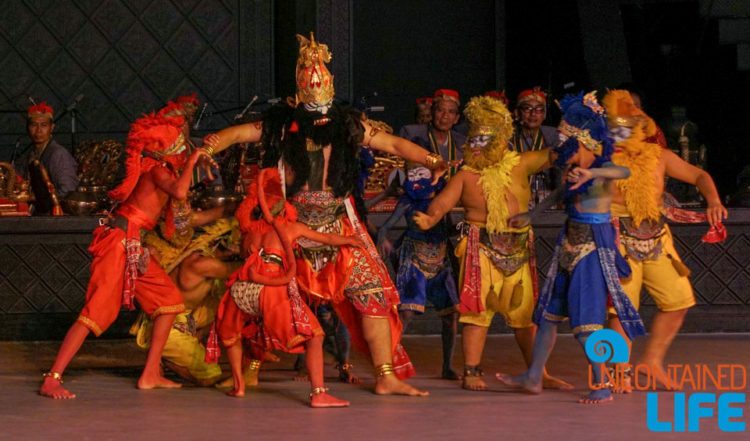 With regard to the performance, Hotmangaradja said the Ramayana tale presented was taken from reliefs carved into the walls of Prambanan, thus it was called Ramayana Prambanan. Separately, PT Taman Wisata Candi Borobudur, Prambanan and Ratu Boko president director, Edy Setijono, hoped the inclusion of Borobudur and Prambanan on UNESCO’s world heritage list could increase public awareness and encourage people to help preserve the sites. 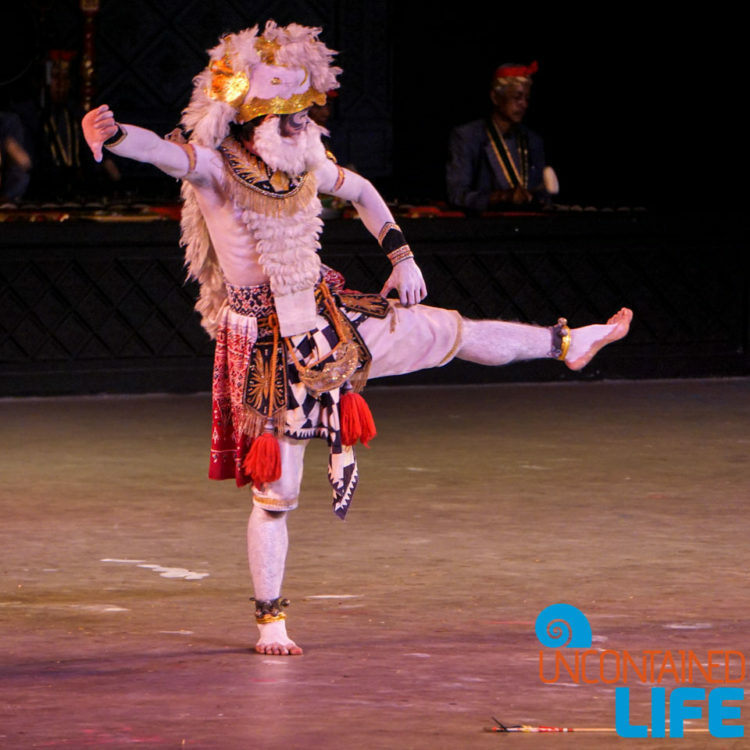 The first time I watched the Ramayana Ballet show was back in 2009. Though I can’t really recall all the details of that night’s performance, I can still remember that the show was really great. 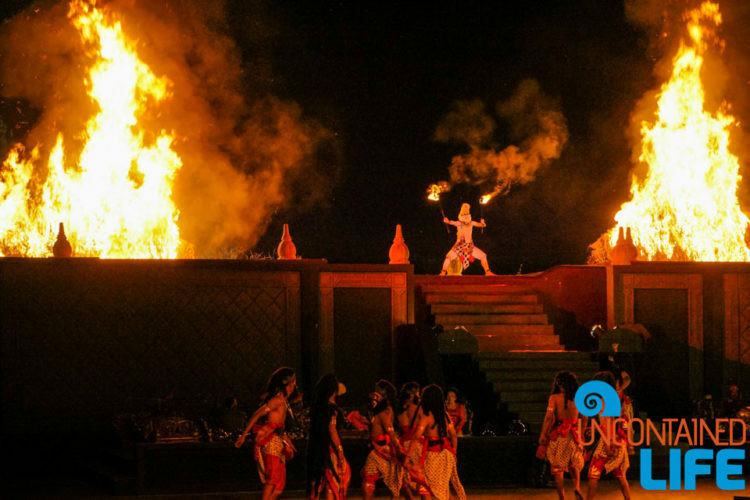 Two things that I can’t forget, besides the companion, were the magical set of the stage, which has Prambanan temple as the background and the scene where Hanoman was lit the fire at the Alengka Palace. It was fascinating. 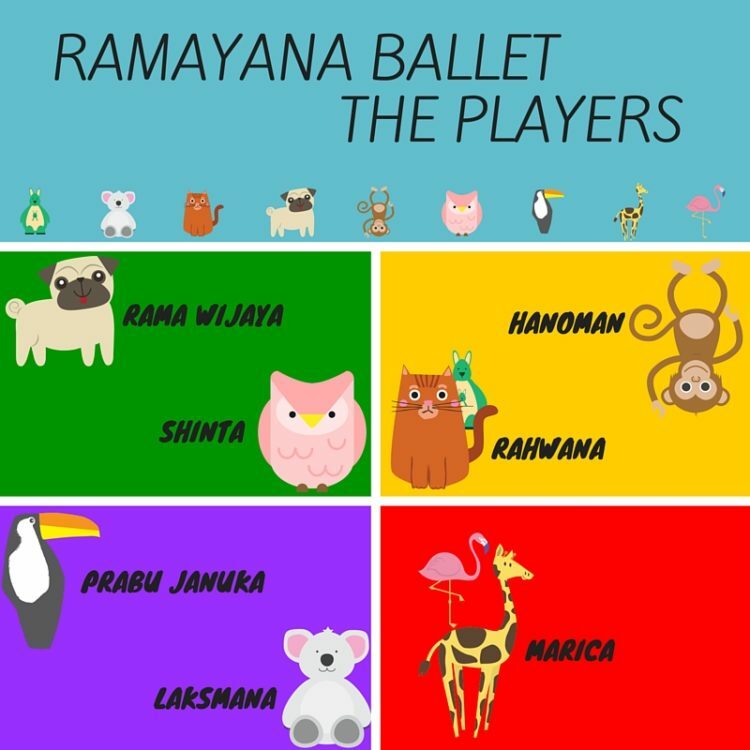 Recently I’ve been wanting to watch the Ramayana Ballet again. A few days ago I decided to play tourist in my own city and go to a Ramayana Ballet performance by myself. I knew it was going to be a magical night and I was excited. You can actually reach Prambanan easily by yourself with the trans Jogja bus, but since the Ramayana Ballet show starts at 7:30 pm and finishes around 9:30 pm, it’s easier to take a private car or shared transport (plus I don’t know if you can still find the bus at the end of the show). You can find out more about the tour below. As I explored the venue I saw several of the actors in costume standing before the entrance gate. You can take a picture with them, although I didn’t. When I visited I saw Rama, Shinta and Hanoman the white monkey. 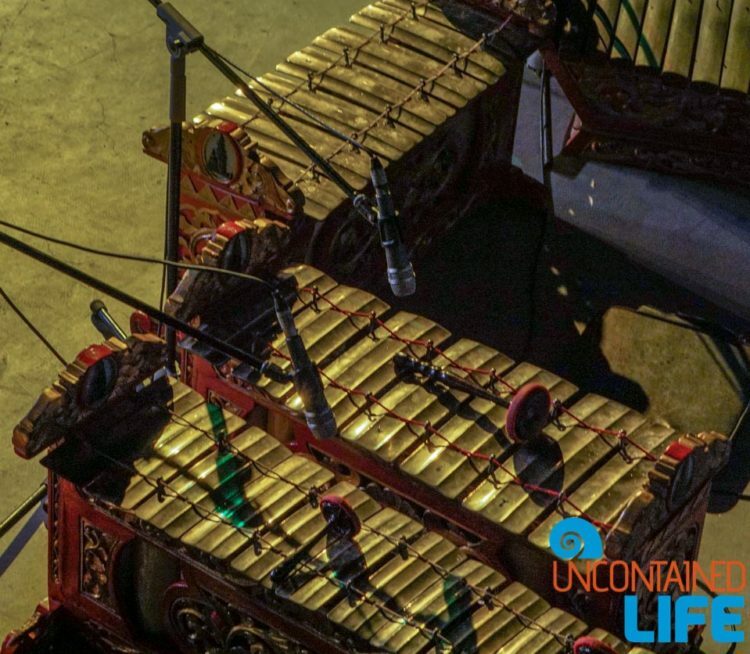 Once you enter the gate, you’ll get welcomed by Gamelan music Cokekan. 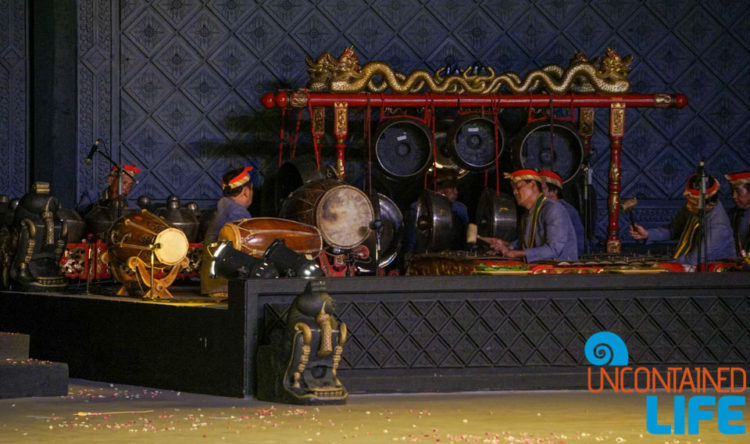 There was one singer along with three people who played the traditional Javanese instruments. It was a great welcome. Not far away from the entrance you’ll find a station that provide a synopsis / the plot of Ramayana full story in a piece of paper. It was available in Indonesian, Spain, English, Germany, Ducth, French, Korean and Japanese. Amazingly the show started on time. Around 7:28 pm the music started playing and the master of ceremonies greeted the audience. Once the show started, I can say that all the audience was stunned by the performance. Everyone was very quiet, while they enjoyed the love story of Rama and Shinta. Yes, I won’t say much about the show because you really need to experience it for yourself. This was the second time I saw the Ramayana Ballet show and I still loved it! On this occasion, I watched the condensed performance. However, I want to watch the episodic show sometime in the future. People say that for the episodic show there are more dancers and the plot is more detailed. I’ve never watched the indoor performance before, but I have watched the outdoor. Here’s a sneak peak at what you can expect when you watch the ballet for yourself (it’s not very long. I didn’t want to spoil the story for you). 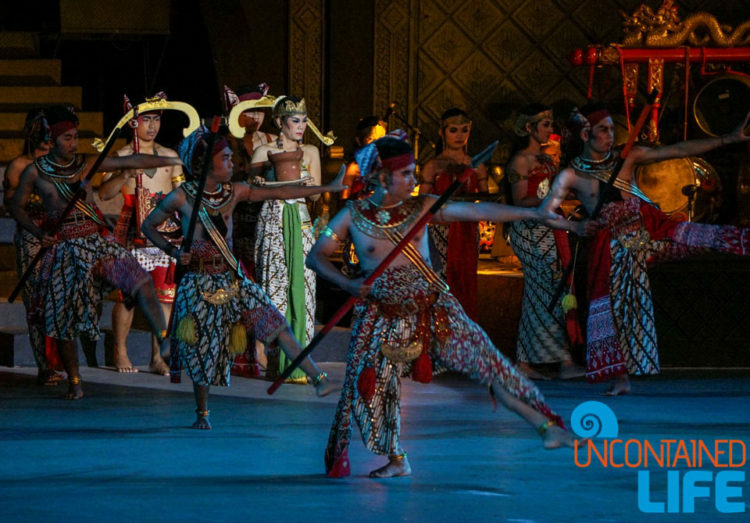 The Ramayana Ballet is also performed at Purawisata Jogjakarta (Jl. Brigjen Katamso, Yogyakarta 55152) every night. Purawisata is around 15-20 minutes away from Malioboro Yogyakarta. 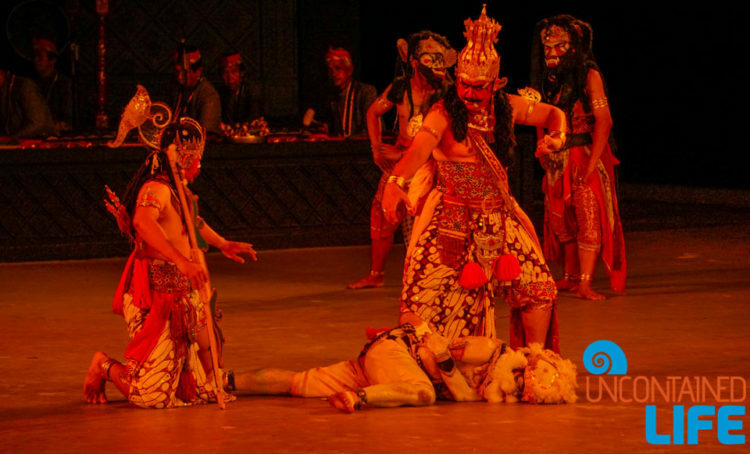 I haven’t watched the Ramayana ballet in Purawisata so I couldn’t give you a proper comparison. I’m just a lover of a show on an open air stage with Prambanan temple as the backdrop.